I got the idea for this cupcake from a Halloween flier at Joann’s craft and fabric store. My husband said, “What is this–a pumpkin by a goalpost? 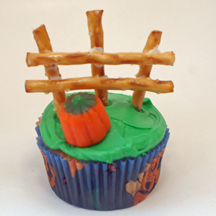 I think it’s cute: a pretzel fence and that ever-popular Halloween candy, the mellocreme pumpkin. What You Need: 1 cupcake; frosting tinted green; a bit of white frosting; 5 stick pretzels; 1 mellowcreme pumpkin. How to Make It: Frost cupcake green. Use dabs of white frosting to stick pretzels together like a fence. Stick into cupcake. Add mellocreme pumpkin. This entry was posted on Friday, October 24th, 2008 at 11:16 pm	and is filed under Halloween cupcakes. You can follow any responses to this entry through the RSS 2.0 feed. Responses are currently closed, but you can trackback from your own site.